How much does it cost me to reject one ton of heat to cool my buildings? How much does it cost me to generate one pound of steam to heat my building? What does this have to do with water treatment? 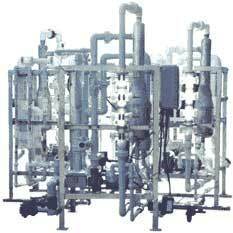 Traditionally, industrial fire-tube boiler and open loop cooling systems use chemicals to treat their water. This technique has not changed much for decades. By the very nature of the chemical treatment process, it is doomed to fail. Often the chemicals are improperly balanced due to makeup water or foreign contaminants that are pulled or blown into the towers. As unmanaged solids in the water reach critical levels, rapid scaling occurs on both boiler and condenser interior surfaces, tower components, and even distribution piping. The scale that builds up, decreases tank volume and acts as an insulator reducing the heat transfer efficiency of all heating and cooling components, robbing you of your energy dollars. 1mm of scale (the width of a line that most pens draw) can increase electrical costs 10%. As build up increases, the volume of your water decreases. Did you know many towers are considered to be biologically hazardous areas due to the algae, fungus, bacteria and viruses that thrive in these wet environments? The disposing of these hazardous chemicals back into our precious water supply makes the environmental impact even more detrimental! In plain language it costs you much more, much more, than chemicals to treat your heating and cooling systems. Expenses can be inclusive of, but not limited to the loss of productivity, excess electricity, water, sewage, equipment maintenance, repair, and even replacement. These operational expenses are all impacted as a result of scaling and bio-film that can build up in your systems. Contact us and we can talk about the expense of water cleanliness as it relates to you individually. If you know all of the expenses involved in your operation, you can begin to calculate them here. "No other water management system on the market today inhibits bio-film, scaling, or removes contaminants like the AquaDyn Water Management System." AquaDyn Technologies is an innovative company providing a cost-saving water treatment service for the boiler and cooling tower industry. Besides saving you in chemical, electrical, and water and sewage costs, AquaDyn Technologies provides benefits that far surpass expectations. Can your chemical supplier maintain these optimum water parameters? If not, then it's time NOW to stop using chemicals and switch to the The AquaDyn System! Industrial boiler and cooling systems are a key element to the profitability and production of industries worldwide. The water treatment used in these systems can increase or decrease operating expenses such as electricity, water and sewage, equipment maintenance and repair. Furthermore, water treatment methods can directly effect productivity quotas if plants have to be down for equipment repairs.